Galganov's Easy Recipe for the Potato Latkes! Add in flour - enough to absorb redisual liquid (and baking powder if using this). Add salt (about ¼ to ½ tsp) + pepper (about ¼ tsp) or to taste. Some additional flour may be added, if needed, to absorb excess liquid. 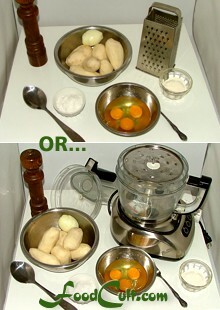 Drop potato mix by spoonfuls into hot oil (a slotted spoon may be useful to leave residual liquid behind). Remove latkes to a paper towel to help drain off the oil. Add oil to the pan as needed. Serve hot with plenty of sour cream, apple sauce or your favourite condiment. Latke is Yiddish for pancake. 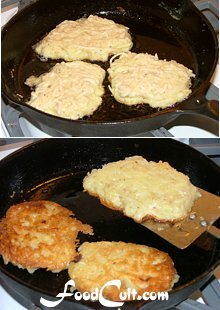 The potato latke, or "pancake" is a treat traditional in Jewish homes - particularly at Chanukkah although it is served and enjoyed at any time of year. It is not substantially different than any other potato pancake although tradition does offer some dictates as to how it is usually served. These are not hard-and-fast rules, rather, they are traditional approaches. 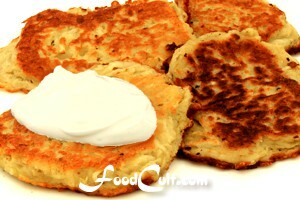 For example, the Potato Latke is served, most often, with sour cream. Others prefer apple sauce - also quite delicious! At the Passover holidays it will be prepared with no rising agent (ie, baking powder) while substituting matzo meal for the flour (since flour is never used during that holiday). This preparation will yeild a slightly crisper version - equally delectible. Some, in fact, never use baking powder since they simply prefer the crisper pancake rather than the slightly fluffy one that the inclusion of baking powder yields. The French will often use scallion or shallot rather than onion - very good but not "traditional". This recipe makes a pretty good sized batch of latkes. We will refridgerate them, reheating them as we want. These can be reheated in the oven or on the stove-top. We have not tried heating them in a microwave so can offer no guidance on this approach. This is a bit of an oily dish so if reheating in a pan, you may try using little to no oil. This works for us depending upon the pan. Even, sometimes, when in a rush we'll enjoy one cold - just grab it from the fridge and chow down (but they're WAY better reheated). Now, go make yourself some latkes - and remember, if you prefer a thinner, crisper potato pancake, just don't use the baking powder.